There are a lot of things to love about spring, and allergies are not one of them. A big reason for them is pollen, which many people are allergic to. Pollen is released by trees, flowers, grass and weeds as they start to fertilize and grow once the temperature increases. But there are many more different causes of allergies. In fact, allergens are present year-round. Things like dust, pet dander, mold and mildew are other large causes of allergies and respiratory problems. With all the new activity around the house kicking around these irritants and the increase in pollen, spring always becomes the worst time of year for allergies. To help save you lots of sneezing, coughing and runny noses, we thought we would give you some simple and helpful tips for fighting allergies this spring. Rugs, carpets and other non-leather, wood, plastic or metal furnishings like chairs and sofas are like magnets to dust and dander, especially for pet owners. These allergens get caught deep in the fibers of whatever surface they find. Then when someone walks or sits on them the rerelease into the air. A good way to prevent this is to vacuum your carpeting and upholstery and shake out your rugs often, once or maybe even twice a week. Oh, and always be sure to dust non-fibrous surfaces frequently as well. If you are troubled by allergies and are considering making some changes around the house, you can think about replacing your carpeting with laminate or hardwood floors. Mold and mildew grows in places that are high in temperature and moisture. As you can imagine, your bathroom is an ideal location for it to grow and take hold. These allergens are also the cause of a lot of respiratory issues and need to be addressed. It is fairly common for most bathrooms to have some level of mildew, and mold is typically pretty easy to spot. But, here are a few ways of seeking it out not only in your bathroom but around the house as well. If you spot mold and mildew beginning to appear, scrub it with soapy water or one of the many anti-mold sprays at your local hardware store. If the problem is too severe, you may need to call in an expert. When it comes to preventing them there are a couple different methods you can use. Make sure to keep your bathroom dry with fans and there is even special mold-resistant paint available to use in your bathroom. We know, we know, it is going to be so beautiful outside that it may feel nice to have a breeze come through the house. As nice as it may feel, you are opening yourself up for pollen and other airborne allergens to enter your home and wreak havoc. That doesn’t mean you should be a total shut in, though. Just be smart about when you choose to take in the spring breeze. For example, as nice as it may be to have the windows open during the evening, pollen counts are highest between 5 a.m. and 10 a.m. Besides, you can always rely on your air conditioner. 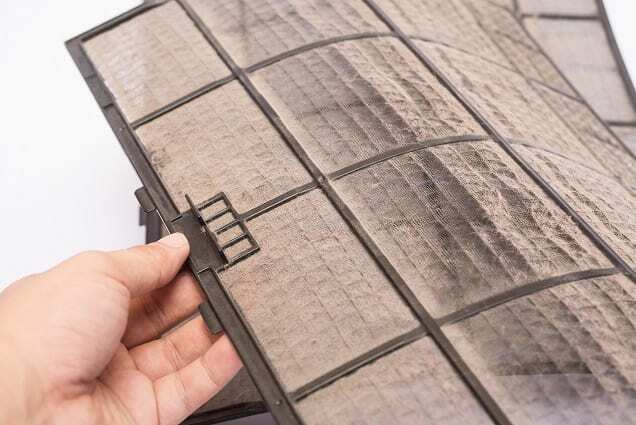 Just be sure you always keep those vents and air filters nice and clean. Those are other hot spots for dust and dander accumulation.